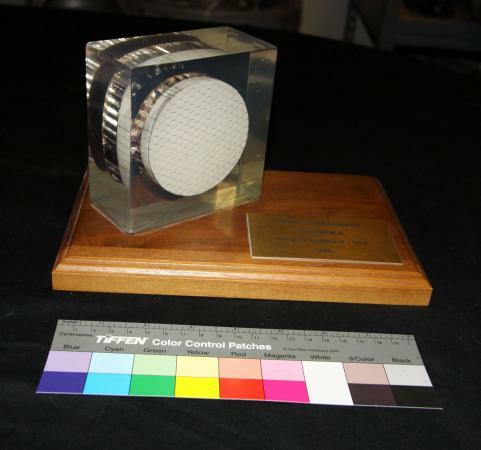 Unflown ablative heat shield cross section sample adopted from the Gemini spacecraft for application on the Manned Orbiting Laboratory (MOL) program. The heat shield was intended to protect the the crewed MOL capsule against the enormous heat of reentry into the atmosphere at speeds of more that 27,5000 kilometers (17,000 miles) per hour. Like those of other early Gemini and Mercury spacecraft, MOL's heat shield derived from ballistic missile warhead technology which leverages ablation (charring and evaporation) of the heat shield surface to protect the returning payload or crewed capsule. The MOL program was initiated by the U.S. Air Force, with an objective of enabling manned on-orbit capability to conduct photo-reconnaissance. With the exception of a single unmanned test flight, MOL never progressed to operation (unmanned photo-reconnaissance satellites demonstrated the desired capabilities minus the risk, endurance and cost issues which would have arisen with manned reconnaissance platforms).